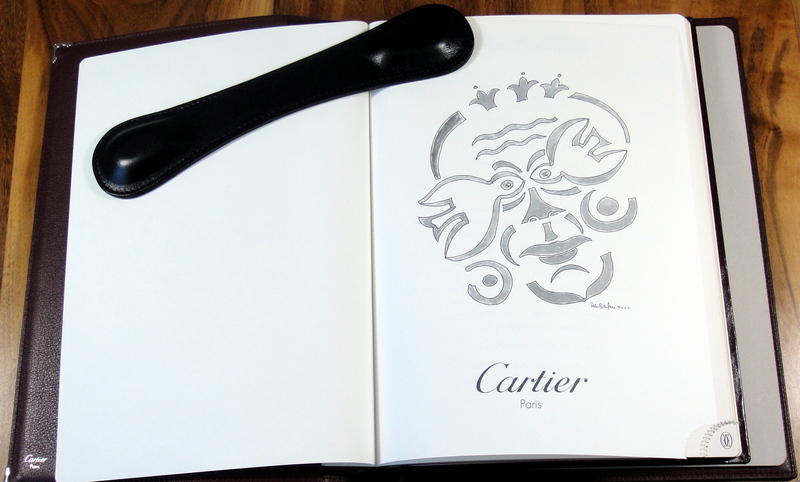 A few years ago I received this beautiful Cartier Desk diary as a gift. 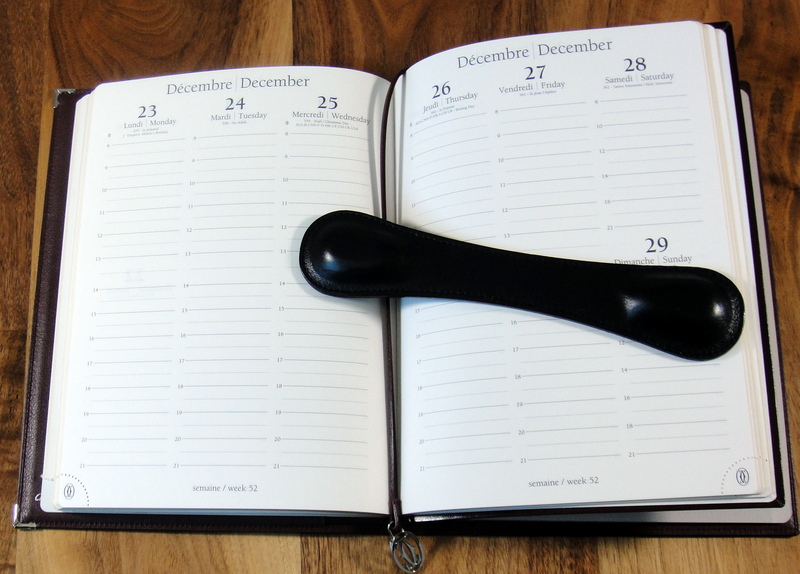 It is appropriately called a desk diary as it is quite large at 10″ x 7.5 “. 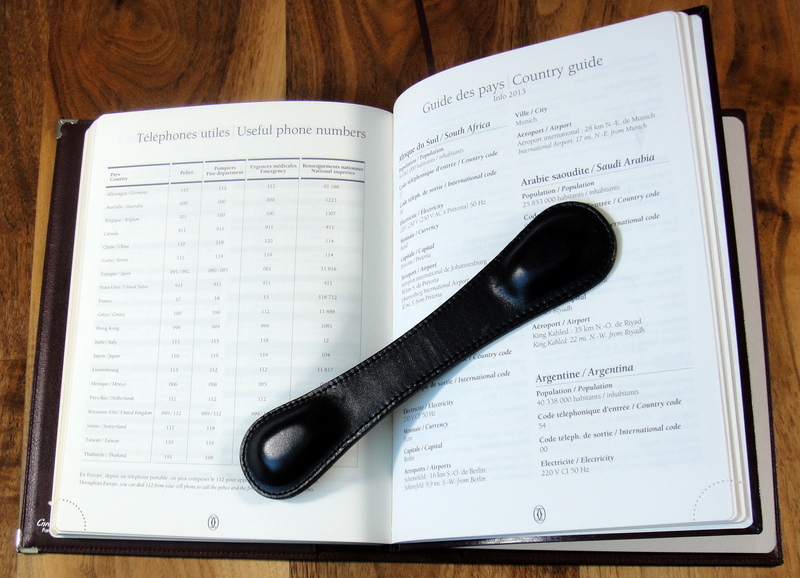 The leather cover and thick pages also make it quite heavy. 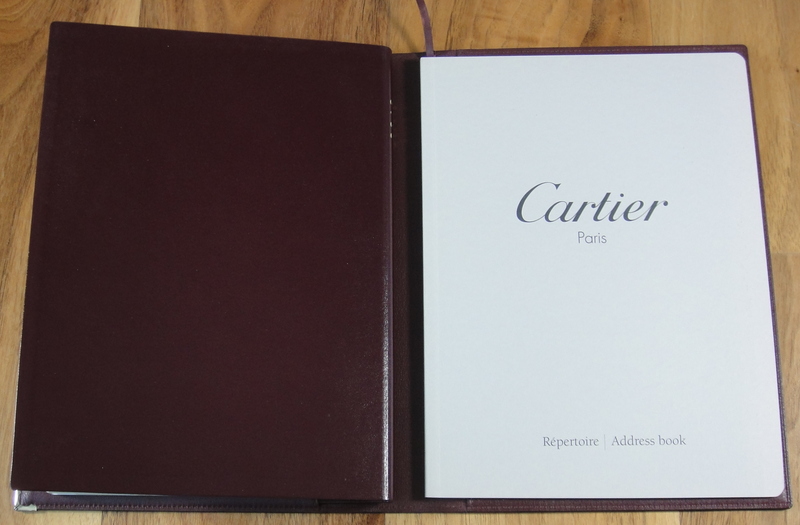 Let’s start with the design; the cover features black leather calfskin with the double “C” Cartier logo embossed on the front cover. 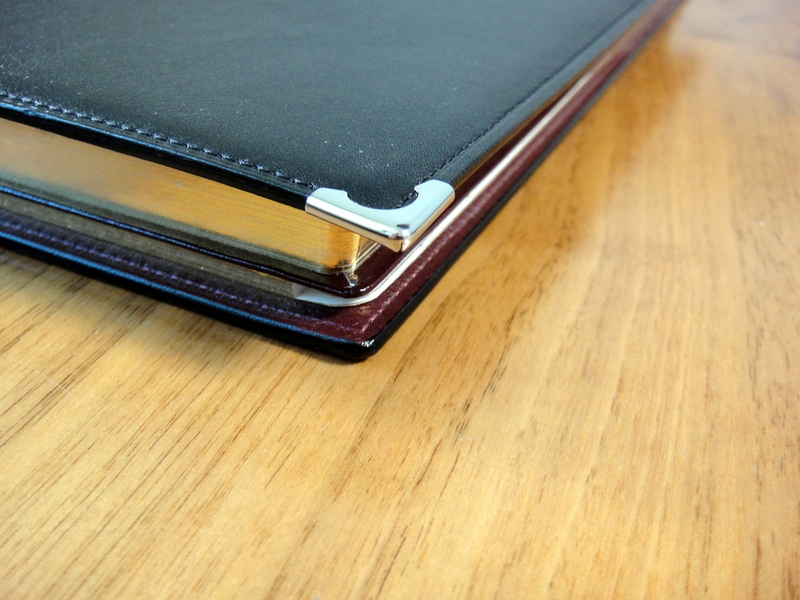 Also on the front cover are two stainless steel corners for added durability. 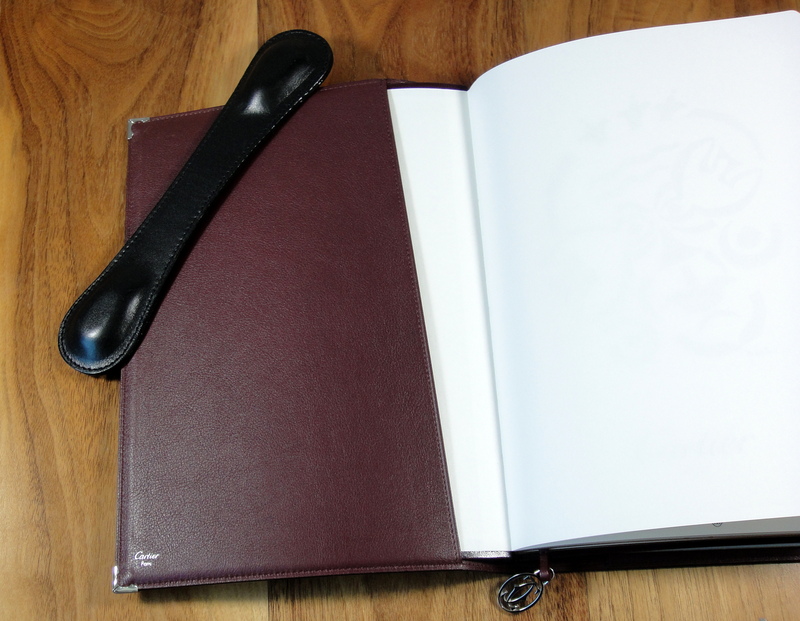 On the inside is an attractive burgundy colored calfskin with two pockets to hold the diary refill and an address book. 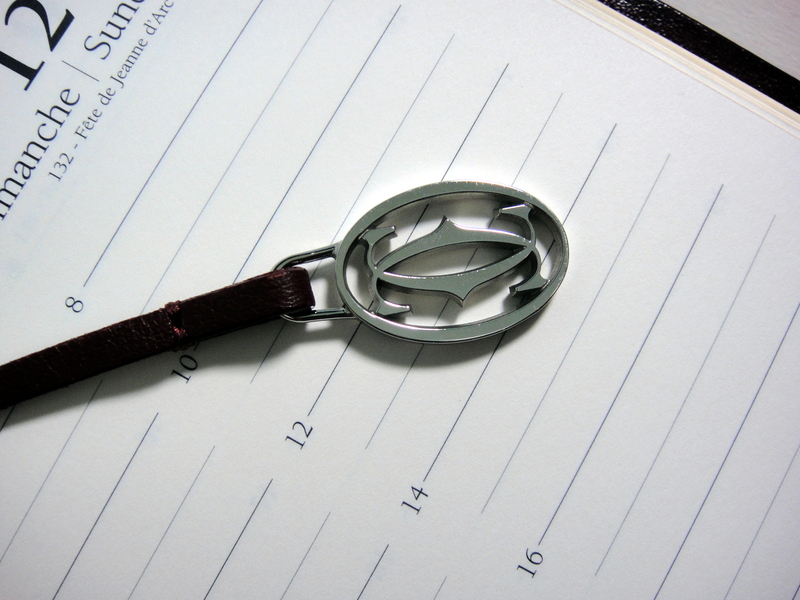 There is also a nice leather page marker with a stainless double “C” Cartier charm. Overall it has a very nice and clean masculine look to it. 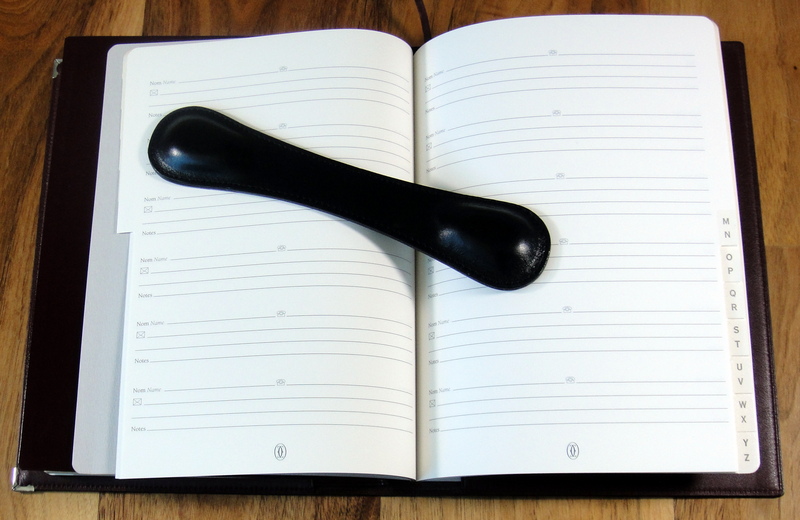 The agenda refills feature seven days on two pages organized by lines for each half hour starting at 8am and ending at 9pm. 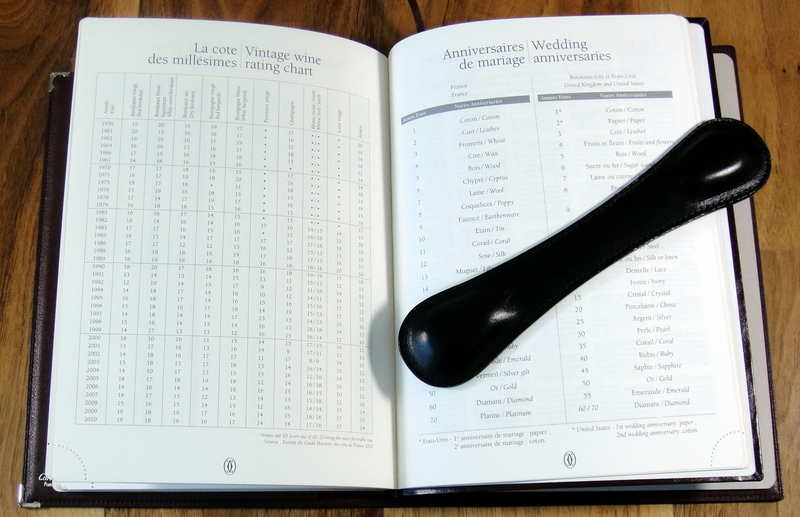 The weekends share a single column and get one line per hour. This layout wont be that useful for everyone. As someone that charges my clients by the hour, I used it to keep track of my time spent rather than as a pure appointment book. Cartier also lists these additional features (I put the most amusing ones in bold): “calendar of international holidays, world map and map of the European continent, flight times and time zones, area codes, useful telephone numbers, conversion tables, clothing and shoe sizes, gold and the most beautiful stones in the world, ratings for vintages, wedding anniversaries, addresses of Cartier boutiques.” One of the things not listed is a country guide which has up to date information on 35 different countries: population size, the capital city, airport info, currency, and electrical information. A diary wouldn’t be complete without an entire page on gold and an entire page on precious gems right? 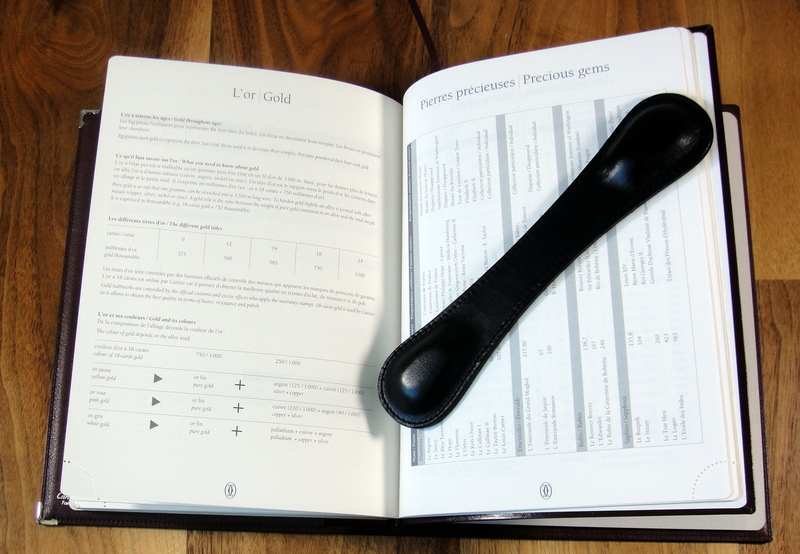 The cream colored pages are very thick and feature a gilded edge. 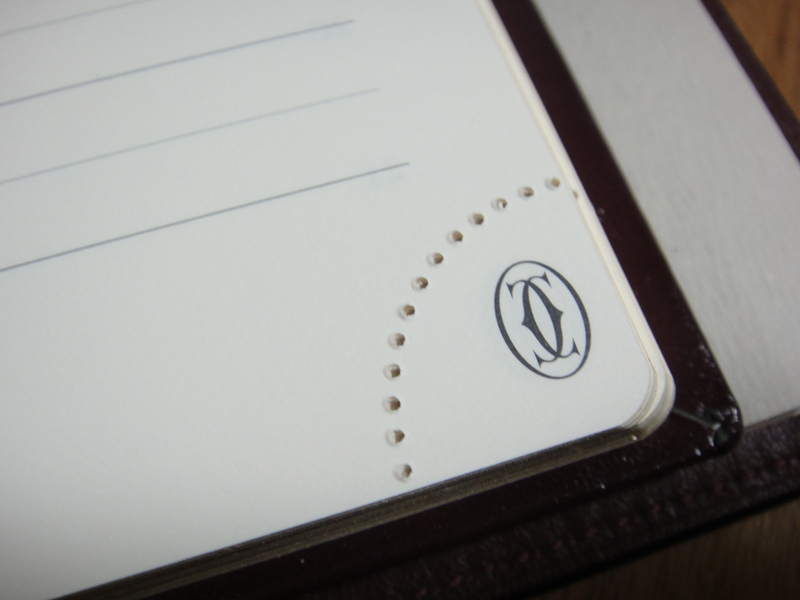 The paper deals with fountain pen ink well and has perforated bottom corners with the double “C” Cartier logo that allow you to quickly jump to the current week. 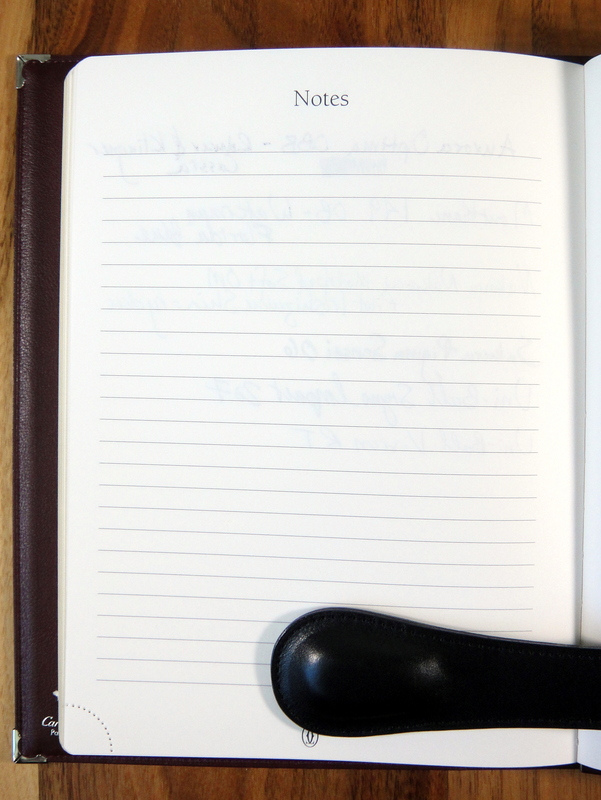 One thing that I really don’t like about this diary is the inability for the refill to relax and lie flat (even with daily use). I have to use a book weight to keep the darn thing open. Each year there is a different work of art featured on the first page of the refill and on the back page there is a little bio of the artist, for 2013, the artist was Patrick Vilaire. 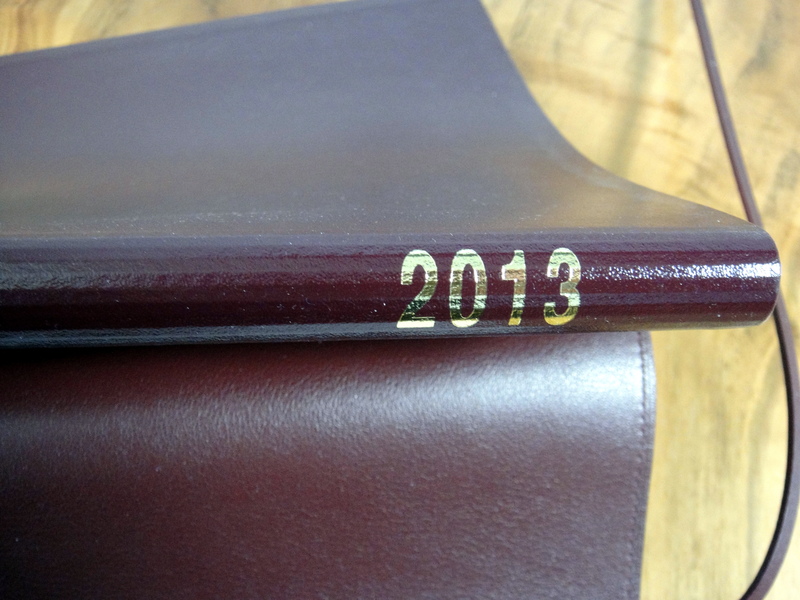 The outside of the diary refill is burgundy, the same burgundy as the leather on the inside of the cover. In prior years this has been black but it looks like 2014 is burgundy again. 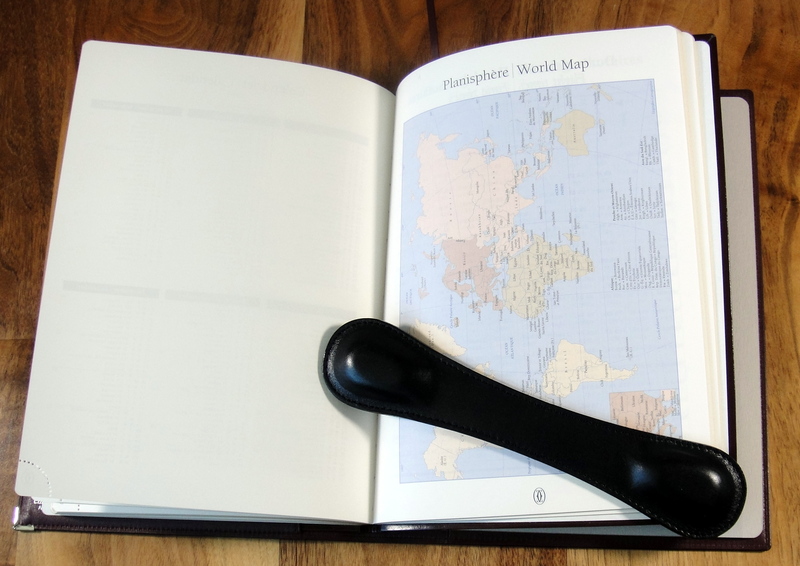 You get a seperate address book with each refill. In previous years the picture was color. I guess they needed to save money this year…recession and what not. New, the cover with agenda refill is $660, which isn’t terrible, but what is terrible is the price of the refills. The 2012 refill cost me $60, the 2013 refill (which you see here) cost me $90 and the 2014 refill, which I have been simply priced out of, is $155!!! I have called and asked Cartier why these have gone up so much and they have no explanation…the refill is essentially unchanged yet worth $65 more. While I have really enjoyed using this diary the real killer for me has become the price of the refill; I will need to find a notebook that I can use this lovely cover with. That is a gorgeous planner. 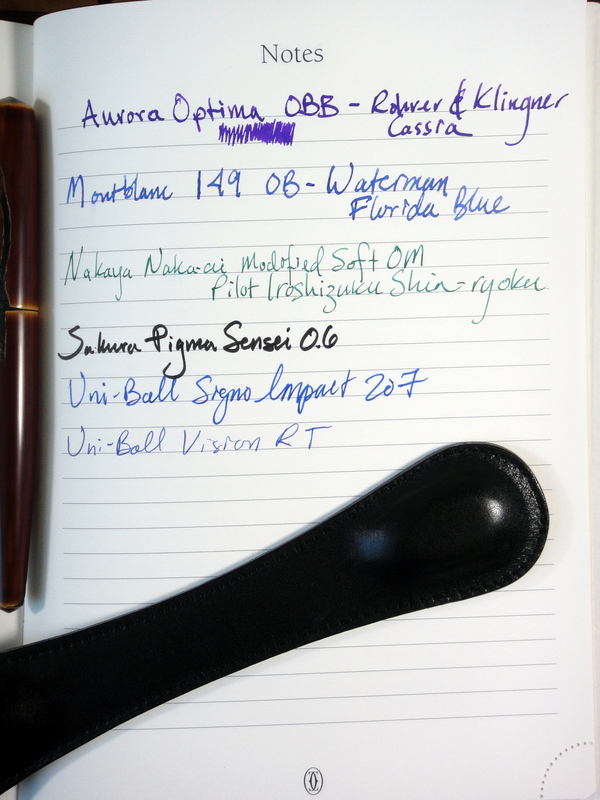 I’ve not seen such a luxurious one like that since my office supply days. Maybe Quo Vadis might be a better planner refill for the price, or an equivalent Japanese one? A beautiful cover like that deserves a nice refill. 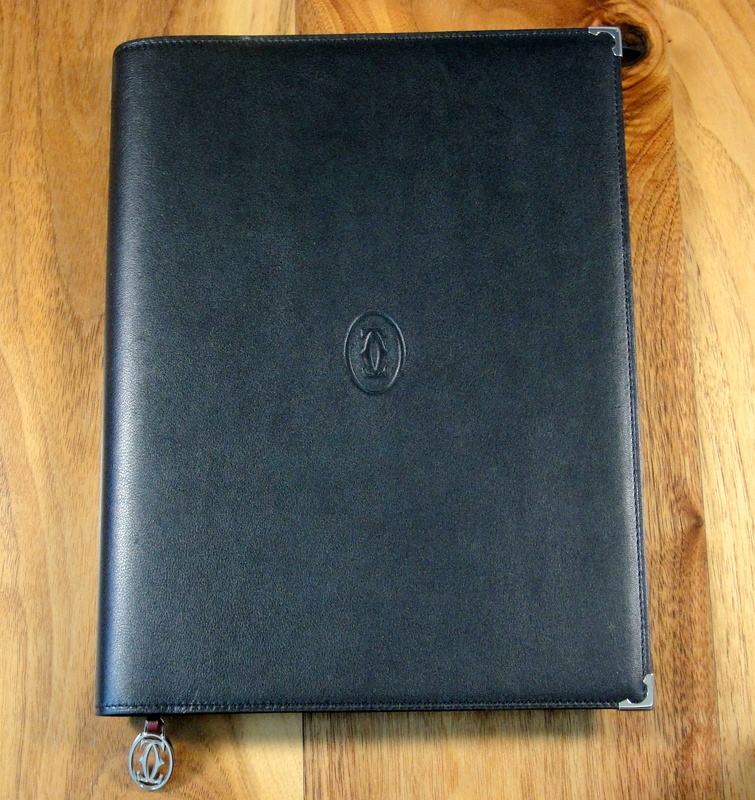 Even a undated refill and journal pages would rest beautifully in it. Thank you for your comment! I have been searching around for one that is the right size but haven’t found anything yet. Thank you for the comment. Sadly, I have not found a planner or even a good notebook to fit my Cartier cover. I’m still keeping an eye out though. Wow this is an impressive find….I will have to order one and report back. Thank you very much DMARCO! Has somebody found a replacement refill ?